What’s Trending? InstaFlo Drain Cleaner – The 60 Second Solution To Clogged Drains! 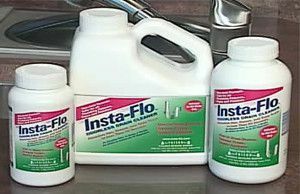 A trusted product amongst professionals, InstaFlo drain cleaner works quickly and without odor to unclog your sink, shower, or tub drain! No longer do you have to wait overnight for a drain cleaner to work. InstaFlo is a non-acid drain cleaner that will liquify hair and grease in as little as 60 seconds! Better yet, it is easy-to-use and will not harm the finish on your decorative sink or tub. Ever sense the product was featured on the Today show on NBC, we have seen all sorts of interest in a product that has never really gotten the notoriety that it deserves. InstaFlo is super easy-to-use. First, warm the drain with hot water. Second, pour one cup of the granules at the top of the drain. Third, slowly pour hot water over the granules so that they dissolve and float down to the clog. Fourth, wait 60 seconds for the InstaFlo to liquify the hair, grease, soap scum, and bath oils, and release the clog. Finally, rinse the drain with hot water and enjoy your new free-flowing drain! InstaFlo is not just limited to the small drains in your kitchen and bathroom; it also works on grease traps, septic systems, and sewer lines. NOT for use in toilets and kitchen disposals. For a how-to product video, click here.